Never Enough Nails: Nicole by OPI Family Vacation Sweepstakes! 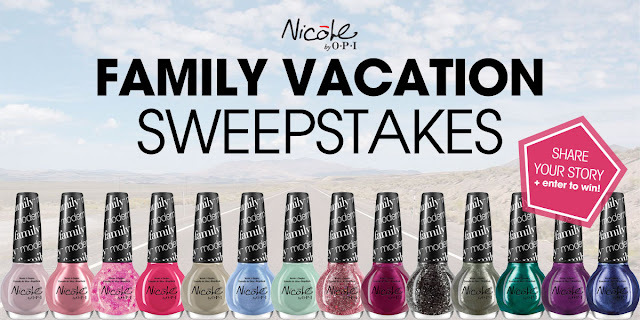 Nicole by OPI Family Vacation Sweepstakes! How to enter: Share your most memorable family vacation story on the sweepstakes tab on Nicole by OPI's Facebook page. This will unlock the sweepstakes entry form - fill it out and click submit! Rules: One entry per person. Valid to residents of US & Canada, excluding Quebec. Winners: 3 lucky winners will be chosen at random on August 5th, so get your entry in today! Let's Go Back to Spring with Lynnderella! Zoya Fall 2013 PixieDust Collection, Part 2! Zoya Fall 2013 PixieDust Collection, Part 1! Born Pretty Store Glow In the Dark Polish! Winner of the $25 Sephora gift card!! Zoya Cashmeres & Satins Fall 2013 Preview!! My 3 Picks from Essie Naughty Nautical!